America, you need to fix your mistake of electing Mr. Trump. If you don't put him in check, he's going to wreck the country. He's really an out-of-control "man-boy". Trump is having one of those Kavanaugh's fits to have his way by shutting down the US Government. This is no way to run a country. Thousands of people working and not being paid. Of course, Mr. Trump is used to doing this in his private business but has forgotten he's in charge of the US Government. Endangering lives, not paying people, destroying people's credit, his unwillingness to compromise, and creating a crisis that doesn't exist are wrong, mean, selfish, unchristian and heartless! ALL THIS TO DISTRACT FROM HIS DIRTY DEEDS and being a sore-loser of the Dems "Blue Wave" Victory. Yeah actually Democrats are the only ones throwing a tantrum about not getting their way. The Trump Administration has given quite a few offers that have been compromises for them. Democrats? Not even negotiating. The Dems are the ones who are delusional, endangering people's paychecks, unwilling to compromise. You had the right accusations but against the wrong people. Where is Bill? He needs to set the record straight. He is able to explain the situation better than I can, at this juncture. Trump is President, bills have been passed (Dems working) but McConnell wouldn't introduce it to the floor of the Senate. Reformed and Wolfgang seem to think America is blind and mindless. A cracker is not a cookie! I don't care how long one shouts, how many people, or wherever. Trump is not a true Republican. Wake up, men! Don't be complicit in hurting, spanking, and the shaming of America. How can I, and why would I, stand with her? How anyone takes you seriously is beyond me. You are clueless. It's easy to point a finger of shame or reflect the same, but it's another thing to make your case. What have I said makes you think I am "clueless"? The Democrats' view writ large (there are varying points of view within the House and Senate caucuses, but there are large pieces of common ground) is that the government should not be shut down and 800,000 federal workers should not go without pay while Congress and the President wrangle over a policy dispute. 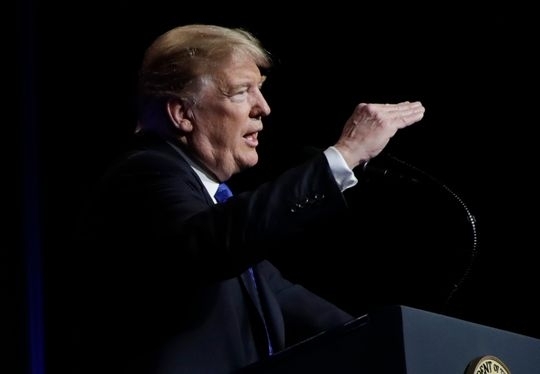 In that spirit, Democrats have proposed - and in the House have or will soon pass - bills that would fund areas of the government not associated with border security for six months, and border security-related areas of government for about four weeks to allow for additional negotiations. The fundamental point Democrats make is that we should not shut down the government and force federal workers to miss paychecks simply because the White House and Congress can't agree on legislation. Legislative differences arise ALL THE TIME in Washington without government shut downs. But this is a national emergency, the president claims. Of course it's not -- drugs aren't "pouring in" over areas not covered by a wall/barrier (the vast majority of drugs come in through ports of entry) / and net migration into the US has declined considerably over the last decade (the number of apprehensions at the border is MUCH lower than it was) -- but let the president make the claim of a national emergency so the courts can decide the constitutionality of his action, and in the 2020 election, the American people will pass judgment on him, his government shut down, and the members of Congress who supported it. Polls report that the American people hold the president more responsible for this shut down than they do the Democrats in Congress (55%-32% in the new CNN poll). As long as the president keeps 800,000 citizens from getting their pay because he can't get a wall that Americans don't want (56%-39% oppose in the new CNN poll) don't expect the president's popular standing with the country to improve much. who holds the power to approve the funds? the White House or Congress? who makes legislation? @Wolfgang said: " who holds the power to approve the funds? the White House or Congress? who makes legislation? CM said: "...Trump is President, bills have been passed (Dems working) but McConnell wouldn't introduce it to the floor of the Senate". In our system, government expenditures require the the consent of both the legislative and executive branches. The Congress initiates appropriation authorizations through its legislative processes, but any passed bill must then be signed by the president (or be approved a second time, but by two-thirds of each congressional body to overcome a presidential veto). So while our Congress has a necessary role in the process of fund approval, so does the president. Democrats have proposed that the Congress pass and the president sign funding authorizations to reopen the shut down portions of the federal government, funding that would maintain current levels of spending while the parties engage on disputed matters such as "border security." It is the president and his Republican congressional allies who so far have refused to reopen the government on those terms. At issue in the current impasse is the shut down of part of the federal government, including some services within the White House. The VAST, VAST majority of affected government operations are outside the White House, so in my view, your contention that Democrats' intentions are to "shut down the White House" is not supported by the facts. I suppose every legislative dispute between the executive and legislative branches of our government has power elements in it. The president has made clear to his supporters, for example, that he's not going to budge - just yesterday saying "we might be out for a long time." But at the core of the current impasse is a genuine disagreement as to what constitutes border security and whether legislative disputes are properly processed through government shut downs. The president and his allies believe they are; Democrats believe they aren't. I suppose every legislative dispute between the executive and legislative branches of our government has power elements in it. The president has made clear to his supporters, for example, that he's not going to budge - just yesterday saying "we might be out for a long time." But at the core of the current impasse is a genuine disagreement as to what constitutes border security and whether legislative disputes are properly processed through government shut downs. The point seems more clearly than ever that "things did not work out as planned" in the 2016 presidential election, and the "Clinton" Democrats are playing an "all out" power game hoping to change things for the 2020 election. Whether their current doings are finding favor with American people (or with the "Trump voting deplorables") remains to be seen ... the Democrats could well be in the process of shooting their own foot. You're as welcome to your interpretation of Democrats' intentions as I am to my interpretation of Republicans' intentions. We clearly view those two sets of intentions very differently. The point seems more clearly than ever that "things did not work out as planned" in the 2016 presidential election, and the "Clinton" Democrats are playing an "all out" power game hoping to change things for the 2020 election. In my view, the demographics of the new Democratic House members elected in the 2018 midterms don't look much like "'Clinton' Democrats." They are younger, edgier, and more diverse than Clintonian Democrats, at least to my view. Whether their current doings are finding favor with American people (or with the "Trump voting deplorables") remains to be seen ... the Democrats could well be in the process of shooting their own foot. The midterm elections were a significant gauge of the American people's response to Democrats as an alternative to GOP leadership, a response which I think can accurately be labeled favorable. A net gain of 40 House seats, and a loss of only a couple of Senate seats in an election year when Democrats had to defend 10 vulnerable seats? That's a favorable response. In addition, current polling reports a clear majority of Americans blames the president for the current shut down, and do not support his demand for a border wall. All in all, I don't know how public reaction to the Democrats could be more favorable given the deeply divided nation we are at the moment. "During the Obama regime, US Senator Schumer and US Rep. Pelosi agreed with President Obama that Walls do work and supported building a wall. Why do they oppose a wall now? The answer, obvious on the surface, is that with the presstitutes lined up against The Wall, Democrats can use the issue against Trump. However, this answer is not as good as it looks. Polls show that Trump has a far higher approval rating than the presstitute media and that Americans want the wall. So the question becomes: why have the Democrats lined up against the American people by opposing a wall? Why do Democrats oppose Americans having their own country as a place where American citizens live? Why do Democrats want America to be up for grabs by everyone who can illegally cross the border?" A New Year (2019) and the same-old habit, in name-calling. It was my hope that you would check yourself with public expressions in responding to posts you don't agree or see eye-to-eye. I am more disappointed than I am hurt. You were asked to put forth efforts to check yourself and tone toward fellow users of Christian Debate. Your blatant disregard for others and your tone are unbecoming of what you claim to stand for as a man and a Pastor, one wonders, why? Is it you don't or you can't help yourself? Do you think before you type? Would you like someone to speak to you, your wife or child this way? Do you speak to your members this way? Do you have less regard for people online than you do in person? Why do you seem to be bedeviled with the seemingly, uncontrollable tendency, to name call over the most minor statement? Is this the best way you can express dislike or opposition to a person or something? Your behavior reminds me of your President (Trump) you seem to be willing to defend to the death (sad). It's obvious you're hurt. My experience taught me that "hurt people, hurt". The source of your pain I know not, but the reality is unkindness. Are you sicken over Mr. Trump's misdeeds and inevitable downfall, resignation or impeachment? To let the truth be told, the probability is very high one of the above will happen and it's almost guaranteed, he would not be re-elected, at best. Regardless, this is no reason why you should soil these forums with your would-be vulgarity to hurt fellow CD Users. I have never claimed to be a pastor so I don't know why you think I am. Yes. I meant what I said. It is the truth. You truly are an idiot. You may think it is a minor statement, but that proves you are an idiot. Oh no.. I express opposition with fact. But at some point you call a spade a spade and that is what I did. I am not in pain. Trump is doing a wonderful job. You don't have compassion. You are a misguided lackey. A liberal bufoon. Galatians 6:7-10 "Don't be misled - you cannot mock the justice of God. You will always harvest what you plant. Those who live only to satisfy their own sinful nature will harvest decay and death from that sinful nature. but those who live to please the Spirit will harvest everlasting life from the Spirit. So let's not get tired of doigin what is good. At just the right time we will reap a harvest of blessing if we don't give up. Therefore, whenever we have the opportunity, we should do good to everyone - especially to those in the family of faith." Sadly aware of many in America being like Cain in Genesis 4:3, whose gift offering to God was some of his crops (while Cain kept the best for himself). Later Abel's blood cries out from the ground to God in Genesis 4:10. Blood from millions of murdered babies cries out to God plus their mothers (& others) experience guilt from murder. Thankful for awesome redeeming power of the Holy Blood of Jesus while remembering Romans 6:1-2 "So then, are we to say, 'Let us keep on sinning, so that there can be more grace' ? Heaven Forbid ! How can we, who have died to sin, still live in it." Currently the culture of America is similar to the Northern Kingdom of Israel (arrogant & unrighteous) shortly before Assyrian destruction. Also America is the incarceration nation with many in prison. Irony is prisons allow Bibles (along with other religious materials) while public education schools avoid Bibles for classroom use (while using other religious materials). I have attached for your consideration a proposed constitutional amendment to restore the simple freedom of our citizens to offer prayer in our public schools and institutions. The public expression through prayer of our faith in God is a fundamental part of our American heritage and a privilege which should not be excluded by law from any American school, public or private. Just as Benjamin Franklin believed it was beneficial for the Constitutional Convention to begin each day’s work with a prayer, I believe that it would be beneficial for our children to have an opportunity to begin each school day in the same manner. Since the law has been construed to prohibit this, I believe that the law should be changed. It is time for the people, through their Congress and the state legislatures, to act, using the means afforded them by the Constitution. The amendment I propose will remove the bar to school prayer established by the Supreme Court and allow prayer back in our schools. However, the amendment also expressly affirms the right of anyone to refrain from prayer. The amendment will allow communities to determine for themselves whether prayer should be permitted in their public schools and to allow individuals to decide for themselves whether they wish to participate in prayer. I am confident that such an amendment will be quickly adopted, for a vast majority of our people believe there is a need for prayer in our public schools and institutions. I look forward to working with Congress to achieve the passage of this amendment. U.S. Civil war dispatches included many days of "fasting, humiliation and prayer, with thanksgiving" that had been called by Presidents Abraham Lincoln and Jefferson Davis (on different days in the North & the South). Also sad are history textbooks in American education that have snippets (leaving out God) from the first few sentences of the 1620 Mayflower Compact. David Barton, Original Intent: The Courts, the Constitution & Religion, 1st ed. (Aledo, TX: WallBuilder Press, 1996), 7. Grading President Donald Trump . . .
Would you believe 35 days and no pay for US Government Workers (800,000 plus workers)? The shutdown continues. Sec'ty Ross said, "why don't they take out a loan"? One more rich man having a tantrum and out of touch. Tell me this, why have the House Republicans voted multiple times to pay the Federal Workers despite the shutdown and the Democrats vote no every time? It's not the Republicans and Donald Trump not paying the workers, it is Pelosi and the lunatic Democrats.